Hearts of PANDORA Rose™ Halo collection include the Hearts of PANDORA Necklace, Forever PANDORA Stud Earrings and Hearts of PANDORA Halo Ring all in PANDORA Rose™. Select ring size before adding to cart. 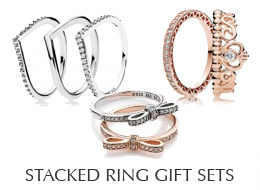 This PANDORA gift set includes a catalog, polishing cloth and is boxed, gift wrapped and tied with ribbon. Please note - gift wrap may differ from what is shown in the photo shown. Ships tomorrow if ordered in the next 1 day, 12 hours and 1 minutes!